Robert Gober’s iconic wax legs and oblique domestic objects possess the force of an eruption. They remain the most evocative sculptural rendition I have seen of the unconscious making itself known. That his work emerged during the plague years of HIV/AIDS only adds to the pain that typically accompanies psychic discovery. Gober is also one of our primary interlocutors with Marcel Duchampnot the Conceptual, institutional-critique Duchamp, but the more elusive and evocative strain of Duchamp’s oeuvre that concerns itself with the problems of love, desire, and marriage. This retrospective of some 140 works from the 1970s through the present includes the return of Gober’s magisterial Dia installation of 1992. The catalogue comes with an essay by critic Hilton Als: Who could ask for a more affective and intelligent pairing? This first major US retrospective of Sturtevant’s work, which will include some fifty pieces made between 1961 and 2014, is necessary. It is necessary both for the artist, who adopted style as her medium, and for MoMA, which, in seeing its canon reflected in her oeuvre, might come to understand itself better. Half a century ago, Sturtevant realized that if you take a work of arta painting by Jasper Johns or a silk-screened print by Andy Warhol, sayand repeat it, something becomes visible. She called that thing the “understructure” of art. Nobodywith the possible exception of critic Bruce Hainley, who is featured in the cataloguehas ever been able to fully grasp what she was after. Back in the 1960s, everyone in New York dismissed her as a pain in the neck. Now that she is no longer among us, things are different, and everybody seems ready to embrace her art. Justice at last! Travels to the Museum of Contemporary Art, Los Angeles, Mar.–July 2015. Promoting a vision somewhere between glory and horror, the postwar German group Zero has long puzzled me. Was their self-proclaimed desire to create a tabula rasato wipe the slate clean for the worldpart of a techno-utopian beginning or an insidious historical forgetting? Or neither? This large-scale survey ventures to find out, showcasing approximately two hundred works and installations by members Heinz Mack, Otto Piene, and Günther Uecker but also by their pan-European network of friends and associates, from Lucio Fontana to Jesús Rafael Soto. Beyond these social and geographic relations, Zero made connections across media, too, linking painterly grid and raster scan, monochrome and screen, bodily movement and mechanized kinesis, optical perception and electric lightand pointing toward a future in which art and technology, human and nonhuman, might merge, for better or for worse. 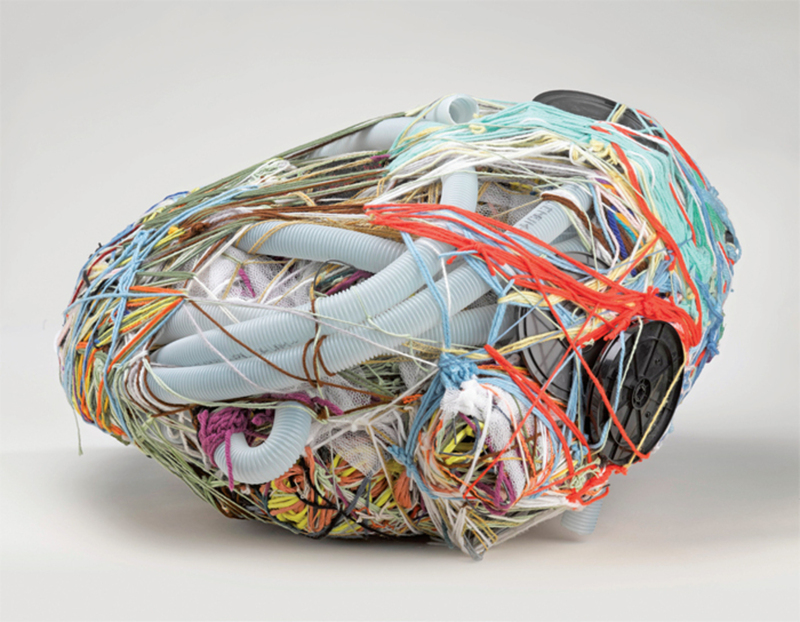 Judith Scott, Untitled, 2004, fiber and found objects, 28 × 15 × 27". What’s called “outsider art” has informed modern art for over a century; Judith Scott’s story shows that its example remains powerful. Born with Down syndrome and then left deaf by a childhood illness, Scott spent most of her first forty years in institutions until she was rescued from them by her twin sister, Joyce, in 1986. Within a couple of years, Scott began to make artworks often taking the form of irregular multicolored bundles and poles, intricately constructed of yarn and found mixed materials and with surfaces recalling the wrapping techniques of artists such as Harmony Hammond and Salvatore Scarpitta. Scott’s work is both nourishing and strange, and this exhibition, of some sixty pieces made between 1987 and the artist’s death in 2005, is her first American survey showour first chance to see her art in depth.